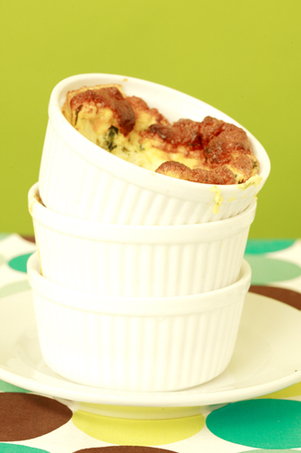 Q: What is the best way to shoot a souffle? A: Out of a cannon. Just kidding – sort of. I don’t often talk about the world of food styling on this blog. Why I don’t know. I did realize, however, that with this particular Hay Hay It’s Donna Day theme some might have some trepidation about taking part. 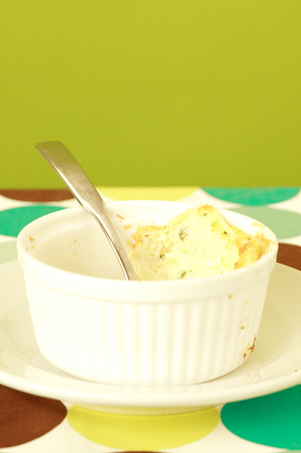 Trust me – taking a photo of a souffle can be done. In fact, I’ve gotten five entries with beautiful photos already! Overdo it. I found in my most successful souffles, I had overfilled the ramekins just enough to get a really grandiose top so that even though it settled quickly, it still had some oomph once it got to its destination. Be careful not to overdo it TOO much – you’ll have an overflow of epic, puffy proportions. Patience, grasshopper. Seriously. It absolutely killed me not to peek. It really did. I’m telling you. DON’T OPEN THE OVEN. Set your timer and simmer down. Have a glass of wine. Check your email. Whatever you need to do to distract yourself you but DON’T OPEN THE OVEN. Cheat. I did not have to do this with my souffle but I was told by someone I work with that adding cream of tartar to your egg whites will aid in keeping it fluffier longer. If you try this trick, do let me know how it turns out for you. Hurry. Ideally, you’re going to want the surface you are shooting on as close to the oven as physically possible. More often than not, your souffle is not going to brave the elements long enough to get it on set if you’re more than 20 steps away. That having been said, wherever you decide to take its photo, get there fast. My last tidbit of info? It’s just food. At the end of the day, your souffle is going to be fluffy and delicious (hopefully) regardless of whether it was photogenic or not. Just relax and enjoy – both the process and the results! oh boy this is going to be a toughie …my best lighting is in another room ! gosh, I love souffles. I think I deserted them when I figured out how many calories I was inhaling with them, but I think I’ll have to give them ago again. p.s. I’ve cheated and opened the oven and never had a problem! I checked out a book on food photography once but stopped reading after it told me to add soapy water to coffee in order to simulate a milky froth. I actually want to EAT the food after taking a picture! Oh boy! This is one of my cooking fears (souffle)…but I do so want to join…we’ll see…thanks for the “good luck” wish…I will need it! Tks for the info you sent me – I’m very excited to participate! I think your tips are great and very useful. http://gigis-rezepte.blogspot.com/2007/01/hey-hey.html . I made them without using my ramekins and only one with, to show that there is not really special stuff required to make tasty and fluffy soufflés.